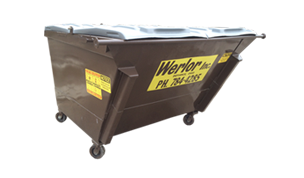 As the largest privately owned full service waste company in the area, Werlors’ decisions are made by vested local owners that have responsibility to the communities we live in. As a fully integrated waste service company, we stress the importance of waste diversion to our customers. Werlor tailors cost effective, environmentally sound recycling services to the specific needs of your business. 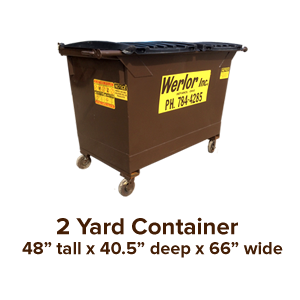 Werlor service shops, hospitals, apartments, restaurants, manufacturing plants, shopping centers, schools and other institutions and businesses with waste collection and recycling systems utilizing on-site containers. 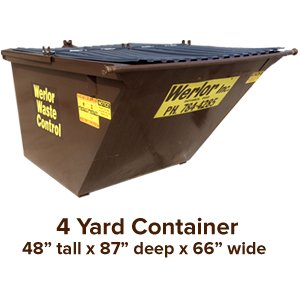 Container types and sizes, and frequency of waste and recycling collection are tailored to each customer’s individual needs. Rear load trucks for commercial usages and Roll off tucks for industrial usages as well as compactors systems provide alternatives to meet every service situation. 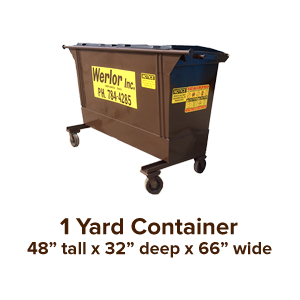 Our smallest container will hold half the amount of a full size pick up truck bed. Each container is wheeled for ease of movement and can be equipped with lid locks. This is a popular size for larger businesses, such as restaurants and factories. 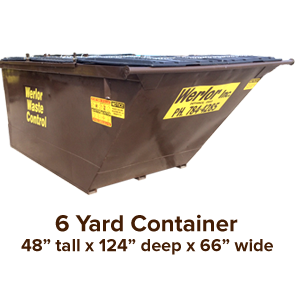 This container has one set of lids to allow loading from the front, it will also hold a full size pick up truck bed of material. This is a popular size for larger businesses, such as restaurants. This container has multiple lids to allow loading from the front or back. This is the largest container that is on wheels. All larger sizes are stationary. This is a popular size for larger businesses, such as restaurants. 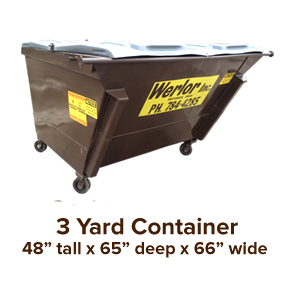 This container has multiple lids to allow loading from the front or back, The 4-yard container will hold up to two full size pick up truck bed of material. This is a popular size for larger businesses and small to mid-sized factories. This container has multiple lids to allow loading from the front or back. 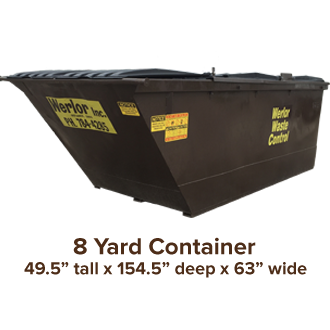 This is the largest of all of our commercial containers. It is a popular size for large businesses, and large factories. This container has multiple lids to allow loading from the front or back. © 2019 Werlor Waste Control & Recycling, Inc. All rights reserved.